A modern BMW 2002 is one of those things we probably all have pondered over at some point. 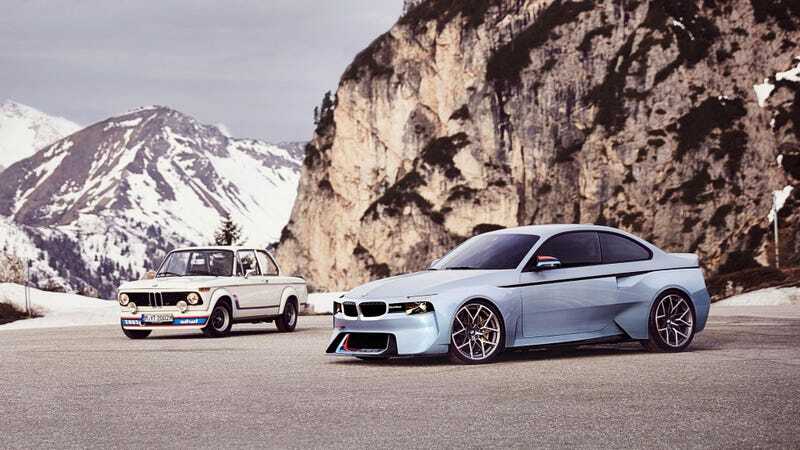 Well BMW did it as part of their string of Hommage concepts, and the reason you’re reading this so late in the day is because it’s kind of forgettable. The new BMW 2002 Hommage is forgettable in the sense that it was brought up multiple times today by the Jalopnik staff and I’m just now getting to writing about it. It’s definitely not the worst design out of the Hommage lineup, of which this is now the eighth design, but it’s also not great. As with the previous Hommage concept taking notes from the 3.0 CSL, I like the ideas worked into the car but overall, the new 2002 is too fussy. I’d say remove about 20% of the cladding and definition, smooth some surfaces and tighten things up a bit, and you have an acceptable “modern 2002" I’d be willing to pay money for in the form of the upcoming 1-Series, perhaps. But I don’t like the now-trademarked disjointed fender arches that we also saw on the 3.0 CSL Hommage, while I do think BMW did manage to pull off squaring some of the cars features, satisfying my curiosity of whether or not a modern 2002 designs study could work. In the end, though, there’s a little bit too much going on without making it the worst thing ever, but it’s also not nearly as pretty as something like the 328 Hommage. The wheels are dope. Oh yea; it has the M2's 3.0 liter turbo straight-six with some tweaks including pistons and bearings from the M3 for around 370 horsepower and about the same lb-ft of torque.